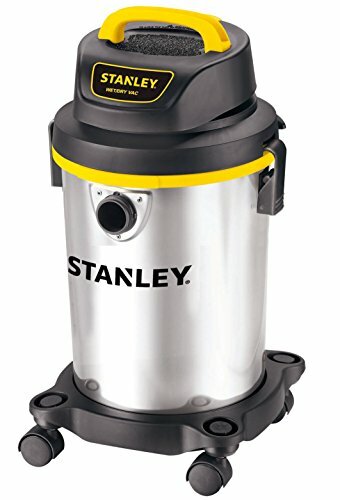 The Stanley SL18129 Portable Stainless Steel Series 4-Gallon 4 Peak Horsepower Wet or Dry vacuum Cleaner features: High performance motor provides maximum power. Light weight compact design for easy carrying. 10-Feet power cord with cord wrap design for easy organized and storage. 4 swivel casters provide convenient multi-direction maneuverability. Accessories included 1-1 or 4-Inch by 5-Feet flexible hose, three extension wands, crevice nozzle, utility nozzle, floor brush, reusable dry filter, foam filter. Disposable filter bag and dust bag (optional). Specifications: HP: 4.0 HP Voltage: 120-Volt, 60-Hertz Tank size: 4-Gallon Airflow: 70 CFM vacuum: 17.5 kPa. Stanley wet or dry vacuum provide superior performance in any environment. From a portable wall-mounted 1-Gallon, 1.5 Peak HP vacuum great for a variety of clean-up tasks any room at home and the garage to the rugged 16-Gallon, 6.5 Peak HP Stainless Steel vacuum for heavy-duty use, Stanley vacuums make short work of even the toughest jobs, saving you time and effort. Vacuum-the number one name in vacuum industry.